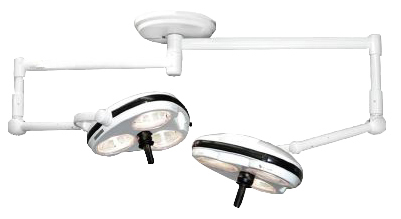 Skytron Dual Head Stellar Surgical Lights provide advanced fixed focus optics within exceptionally durable, lightweight polymer lightheads. 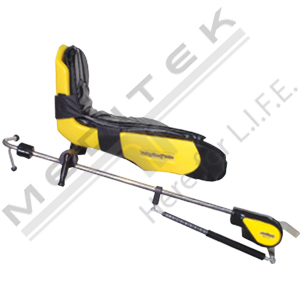 Meditek ReNew Equipment Restoration Program can save you thousands! What’s the difference between remanufacturing and refurbishing? Remanufacturing: rebuilding, repairing & restoring equipment or an instrument to meet or exceed the Original Equipment Manufacturer’s performance specifications. Refurbishing: servicing and/or renovating of older or damaged equipment to bring it to a workable or better looking condition. 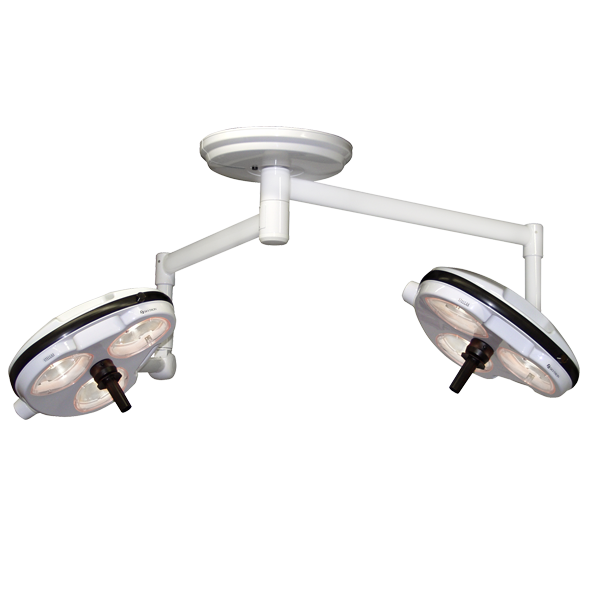 Skytron Dual Head Stellar Surgical Lights provide advanced fixed focus optics within exceptionally durable, lightweight polymer lightheads, creating the perfect balance of performance, maneuverability and dependability. The Vertical Segmented Reflector optics provide shadow controlled illumination and a generous field size. Typical applications include ASC ORs, Labor & Delivery, Exam Treatment and Emergency rooms. 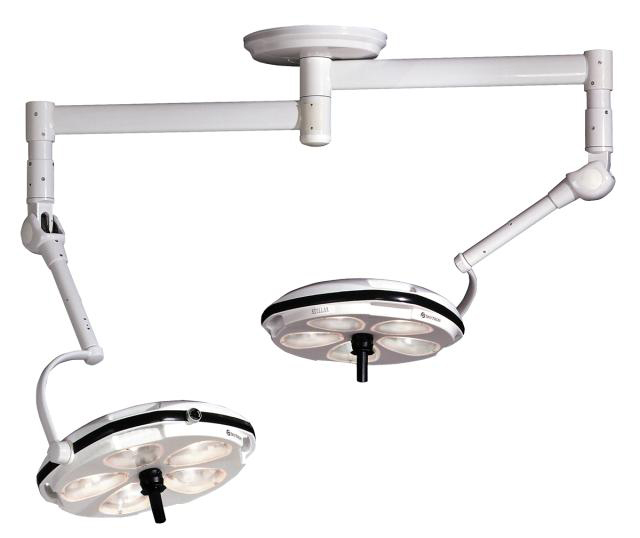 The Skytron Stellar ST1919 surgical light utilizes advanced, fixed focus optics within an exceptionally durable lightweight polymer light head, creating the perfect balance of performance maneuverability and dependability. The vertical segmented reflector optics provides shadow free illumination and a generous field size. Its two 19” diameter light heads provide an adjustable intensity of up to 193,600 lux/18,000 foot candles. Wall Mounted Intensity Control provides continuous intensity adjustment according to surgeon’s requirements and can be set for high or low line voltage to assure maximum performance. Wall Control provides intensity adjustment and ON/OFF control. Skytron Stellar ST2323 utilizes advanced, focusable optics within an exceptionally durable lightweight polymer lighthead creating the perfect balance of performance maneuverability and dependability. The focusable segmented reflector optics provides shadow free illumination and a generous field size. Its two 23” diameter lightheads give an adjustable combined intensity via a wall mounted control of up to 260,000 lux/24,000 foot candles. All Stellar series lights come with Skytron’s exclusive soft-start bulb technology to dramatically extend bulb life. 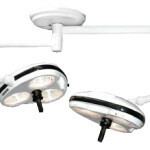 ST2323: Skytron 2 Each 23″ Diameter center focus lights with 110 degree vertical travel. ST2323TV: Skytron Dual fixture with one 23″ center focus and one 23″ camera ready lighthead. Includes 50 ft. of video cable, wall faceplate, counterweight and sterilizable camera sleeve. 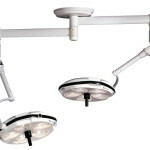 SR LFS ST2323: Supplied Remanufactured Skytron LFSST2323 Dual Head Surgical Light with Flat Screen Arm. Fixture Weight: 124 lbs. 210 lbs. Amperage 3.5 amps, fuse protected. 5.0 amps, fuse protected.